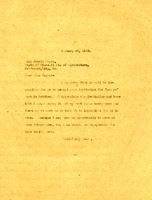 Letter to Martha Berry from Jewell Mayes, a secretary for the State of Missouri Board of Agriculture, thanking Miss Berry for her letter of regret about not being able to attend the Missouri Farmers Week. Miss Mayes expresses her regrets that Miss Berry cannot join them and extends a standing invitation to Miss Berry whenever she might be available for an October Event. She then compliments Miss Berry's work with the Berry Schools by saying it equal to the best in America. 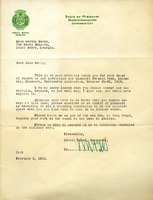 Martha Berry turns down an invitation to attend the Farmers' Week by that State of Missouri Board of Agriculture.